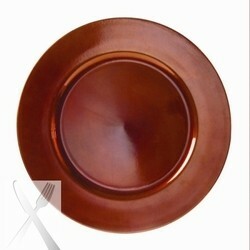 Ten Strawberry Street Lacquer Round Copper Charger Plate 13"
Home > Products > Ten Strawberry Street Lacquer Round Copper Charger Plate 13"
Enhance your table setting with the Ten Strawberry Street Lacquer Round Copper Charger Plate 13". Perfect for wedding receptions and high-class affairs, this product boasts a stunning copper finish that coordinates well with any table decor. Made from premium quality lacquered acrylic, it is lightweight and exceptionally durable. Thanks to its 13" diameter surface, this charger beautifully frames dinnerware, enhancing table decor at your fine dining venue. A versatile accessory, this decorative piece can also be used to create an elegant centerpiece. To properly care for this charger plate, hand washing is recommended.